There’s a lot of interval chat about the characters and who would be whom, but trying to pin the archetypes on each other just shows up how much detail has gone into the performances. The cast of Abigail’s Party hold everything in such a careful balance, knowing when to go broad and when to underplay, that it feels like there are real flashes of danger, especially between the men and women. The moment when Melanie Gutteridge’s Beverly dances alone to Demis Roussos’s ‘Forever and Ever’ is made dreamlike, melancholic – it’s obviously for show, she’s showing off – but then the lights come down slightly and the music smudges. It’s as if she’s taking a breath. In the break between the double feature, an older couple are curious to know what my partner and I thought of Abigail’s Party, since it’s set in a decade that us nineties kids don’t have any first-hand experience of. I’m surprised to be asked, even though it’s a totally sensible question. And this is obviously helped along by Lee Newby’s spectacular brown, beige, and orange set, but the whole thing is so immediately recognisable. It’s Atiha Sen Gupta’s Abi that feels more alien to me, at the catastrophic age of twenty-seven. Abi is fifteen in an environment I didn’t have to navigate until my twenties, a world which demands both your authentic self and your best self. And this balancing act is reflected in the mis-managed expectations of who Abi wants the people in her life to be, who they are, and who they’re actually capable of being. Safiyya Ingar is exceptional. She was easily the most watchable person onstage in Nottingham Playhouse’s Holes and Fifth Word’s Lava earlier this year, so it seems only fair to give her an hour to herself. But she feels closest to fifteen when Abi’s fragile. It’s fun to watch when she’s dancing to Uptown Funk, but there’s a performativity to it that’s too confidently uncool for a teenager. Then again, I’m probably the worst possible age to be making judgements on whether this is convincingly a fifteen-year-old – I think I’m young enough to remember what it feels like, and I’m not old enough to admit that I don’t. Abi has a lot to say about Abigail’s Party – Abi herself spends a lot of the play talking about her grandmother, the absent Abigail – and it’s the first RETOLD I’ve seen that feels like it needs the context of canon. It presupposes you’ll know the plot and characters of Abigail’s Party, which is fair enough, but it also feels tonally so bound to this particular version that it would be a shame to see them apart. And although both of the plays have plenty of laughs, the final bombshells of each are disquieting. Abi makes it clear that we have inherited Abigail’s Party, almost blow for blow. We live in it now. We’re still anxious, highly-strung, and worried about how we measure up. We just have more words to describe how that feels, and more fear about doing that honestly. 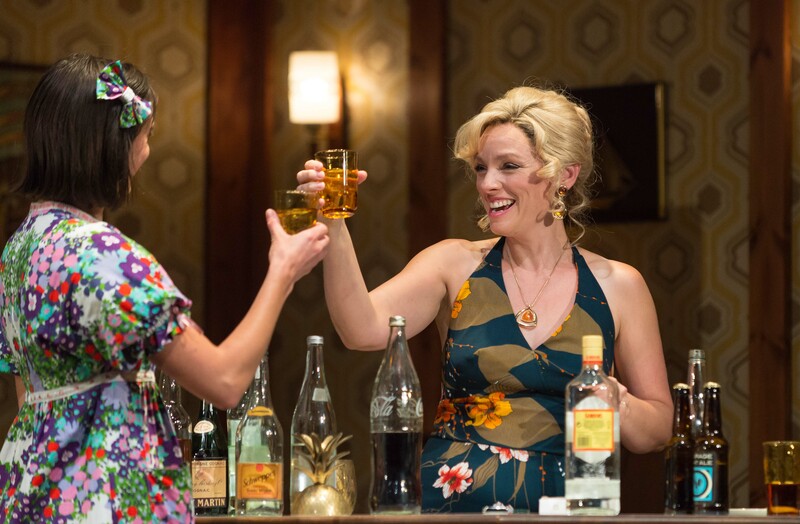 Abi and Abigail’s Party are both on at Derby Theatre until 20th October. More info here.